At Mt Gold we have decorated our geodesic dome in a Otago Safari Theme. Soft colours, sheepskin rugs, mink throws, antique furniture mixed in with stylish modern decor. It’s adorable and very cosy. 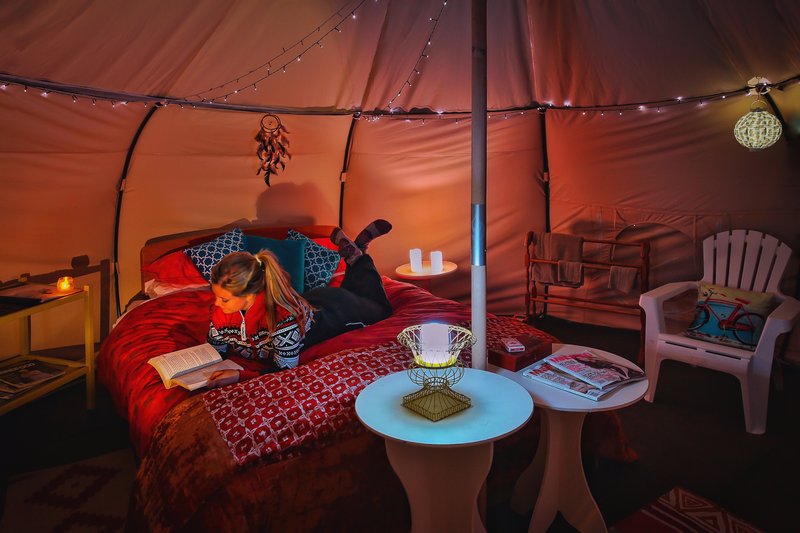 We have also decorated the tent in fairy lights which will magically light up when it gets dark and our eccentric mix of LED candles, lanterns and solar lights will turn your evening into a magical wonderland at night. Our Wilding Pines site is fantastic. Located part way up a hill (3-5min walk uphill from your car), and nestled in amongst a sheltering grove of wilding pines, it’s an idyllic setting. The views from the campsite and even from your bed are stunning – across the lake to the peninsula with the glorious, dramatic Mt Gold in the background. 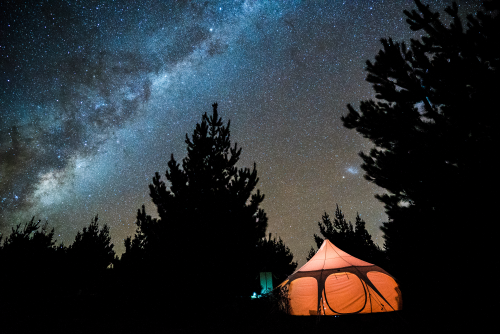 At Wilding Pines we have fitted out a geodesic dome and a lotus belle tent with a queen bed and sofa bed in each, perfect for 2 couples or one or two small families. One tent is fitted out in our Summer Art Deco theme. Bright cheerful colours, fun patterns, pineapples and parrots, it’s all here. It’s a fun environment to kick back and relax in. The second tent is decorated in our Aztec Indian Theme. Warm colours, feathers and dream catchers, and fun patterns abound. There is also a hammock tree tent which hangs suspended approx. 1.4 meters off the ground between three trees and is a great place to relax and read a book. As dusk approaches fairy lights will magically light up and our eccentric mix of LED candles, lanterns and solar lights work together seamlessly to create an ambient, romantic and fun atmosphere. 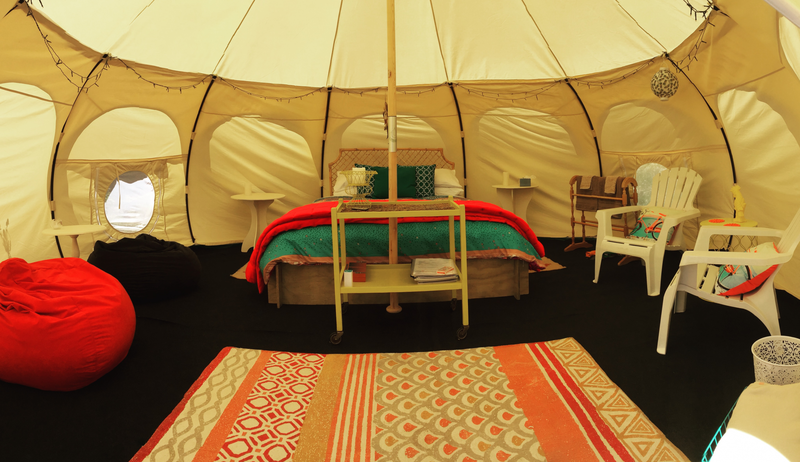 When booking this room you get the whole Wilding Pines campsite but only the use of one tent, our geodesic dome with a queen bed and sofa bed, perfect for a couple travelling with one child. The tent is decorated in our Aztec Indian Theme. Warm colours, feathers and dream catchers, and fun patterns abound. There is also a hammock tree tent which hangs suspended approx. 1.4 meters off the ground between three trees, a fun place to relax.